Already well-known in Edinburgh as one of the city’s key multi-genre strands of dedicated music programming, Summerhall’s Nothing Ever Happens Here (NEHH) pulls out the stops during the Edinburgh Festival month of August, packing in a diverse range of international artists to compete with any other music programme in the city. This year we’re proud to present some major exclusives, including the live return of Lift to Experience, playing one of only two dates in the UK this month. Although their singer and guitarist Josh T. Pearson has received acclaim for his subsequent solo career, the Texan band have achieved almost mythical status for their 2001 record ‘The Texas-Jerusalem Crossroads’, a post-rock concept album exploration of the Second Coming occurring in contemporary Texas. Signed to the Cocteau Twins’ Bella Union label (home of Father John Misty and Fleet Foxes, among many others), the group split soon after its release, and reformed last year at the invite of Guy Garvey to play the Meltdown festival. Elsewhere, we have two more international artists whose work stands at the forefront of all that’s most exciting in guitar-based independent rock music right now. Copenhagen’s IceAge started out as a teenage punk rock group of kinetic force and power in 2008, but have rapidly assumed a more mature and inventive – if no less aggressive – sound, with Elias Rønnenfelt developing into an iconic frontperson. 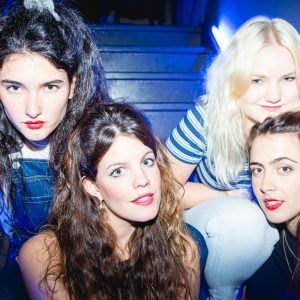 Madrid’s Hinds, meanwhile, are an all-female garage rock group who channel the high points of alternative rock over the last forty years, from the more melodic sounds of C86 and shoegaze to the riotous indiscipline of the sound of Strokes-era New York. Closer to home, we’ll also be welcoming back Glasgow’s seminal and impossible-to-categorise club night Optimo (Espacio) in the same month as they host a festival in celebration of their 20th anniversary, while Pictish Trail’s off-beam pop sound will be dusted off following the latest acclaimed instalment of his homegrown micro-festival Howlin’ Fling on the Isle of Eigg in July.